A moccasin is a unique historic piece of footwear; we are going to take a closer look at some of the highest and best-reviewed moccasins for men. A moccasin is usually made of leather, although today moccasins can also be made of deerskin, sheepskin or moose hide. The unique thing about the moccasin is that you can feel the ground as you walk in them, and they still protect your feet. The first time you probably came across a moccasin was most likely in a classic cowboy movie which also featured some Indians. The Indian tribe’s primary footwear was moccasins; often embroidered and decorated with beautiful patterns or tribe symbols. In this article, we have come up with what we believe is the favorite moccasins for men. L.B. Evans is a big manufacturer of shoes for men; they have everything from loafers to dress shoes. The quality of L.B. Evans shoes are impeccable, and you will often see their products in bestseller lists on Amazon. 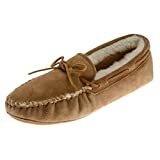 This Moccasin very comfortable and can be used both indoors and outdoors. It’s made from leather and has a synthetic rubber sole and is available in three different colors, two variations of hashbrown and one chocolate color. It’s a padded shoe which provides extra comfort and support, the sole is sturdy and are great to walk with outdoors too. The price of this product is very reasonable, and the craftsmanship and material seem good. One thing our research uncovered was that this shoe could get a bit smelly after more than a year’s use. An excellent indoor shoe in our opinion and with the possibility to run a quick errand in these too, we wouldn’t recommend these if you’re looking for primarily an outdoor moccasin. Minnetonka makes footwear for both men, boys, women and girls. They have a wide range of popular shoes primarily moccasins and slippers available. Their products are super popular on Amazon, and some of their products have thousands of reviews. This brand is selling a lot, and they are doing a super good job. This sheepskin moccasin for men is very casual and very comfy, it has a fully padded insole, and a lightweight soled bottom. To further elaborate on the sole, it’s almost non-existing or just very soft; these are not the kind of Moccasins you want to wear outside. It’s made from genuine suede leather with a rawhide lace. You can except this moccasin to stretch a little bit because of the materials used; you might want to keep that in mind if you decide to go for these. It’s a very traditional moccasin shoe with a modern touch; we think these slippers provide an impressive comfort and warmth. The price is very reasonable, and these are perfect indoor slippers for every man. Available in tan or golden tan. Another pair from our friends at Minnetonka. These Moccasins are made from moose hide, and it is also a very classic Moccasin. Available in classic leather color, chocolate or black. This moccasin comes with a fully padded insole for comfort and style, the rubber sole on this one is hard, and that makes these moccasins a great pick for outdoor too. It has a nice stylish whipstitch on the front of the shoe, a great touch. Even in cold weather, these moccasins can be used; the moose hide is a great temperature regulator. Sturdy, comfortable moccasins that can be used even in cold weather, another great product from Minnetonka. A cool alternative looking moccasin from Double Barrel. Double Barrel products often feature cool different designs, and it seems to be working for them! The camouflage design on this Moccasin is cool and it’s a refreshing touch to a classic piece. This Moccasin is made from leather and has a fully padded insole with pile lining for extra comfort. This moccasin has a hard rubber sole which is very sturdy and durable; it’s also no problem to wear these outside even when it’s raining! If you’re looking for an unusual pair of moccasin, this is the pair you should go for! Tamarac by Slippers International is your specialist for indoors footwear. They feature a lot of products and common for all of them is that it’s primarily for indoor use and very comfortable footwear. This suede leather moccasin comes in three different colors, Tan, Rootbeer or taupe. This shoe comes with a hard rubber sole, so it can be used both indoor and outdoor. It also comes with adjustable cotton laces so you can make it fit your foot perfectly. It is a warm shoe with plush plaid fleece inside, so you can also use this outdoors in the winter. 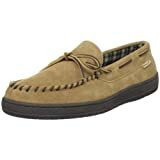 Very reasonable priced at only $30 when this article was published, this is a cheap and reliable choice if you’re looking for a classic moccasin. We hope that you found something you could use in our small list of moccasins. It is a very classic piece of footwear which complements a lot of different styles; it can also easily replace a classic indoor slipper. Sanuk is a really cool brand with an awesome feel good vibe, their motto is smile… pass it on! Sanuk is a subbrand of DeckersBrands and a really big manufacturer of different kind of footwear for men, women and kids. The people behind Sanuk are musicians, surfers, skateboarders, dreamers, introverts and extroverts. DeckerBrands motto is we are who we are and they are hugely successful, they treat their employees well have a great CSR policy and a lot more. This brand is awesome. This shoe is really a beauty featuring awesome moccasin stitching and it’s made from cotton, linen and leather. You can get in a wide array of colors, Black, Blue, Brindle Vintage, Grey and Olive vintage. It has a huge number of 5 star reviews and is priced at only 22$ when this article was published! Good old Ralph Lauren, the famous polo player is in no need of further introduction.. This shoe comes in a wide array of colors Dark Denim, Tan, Cream, Navy and Olive. An awesome mish mash of leather, canvas and a rolled moccasin stitching. This is a shoe with a strong visual character and super classy. All in all this a very comfortable shoe reasonable priced and the famous polo player will be recognized everywhere! Timberland is a very well-known brand, mostly known for their famous Timberland boots, a rugged durable waterproof leather boot. Timberland started out in 1973 and today their brand is a symbol for quality and authenticity. This shoe is a very cool combination of the classic vans mixed up with moccasin stitches and lacing! Despite being a traditional boat shoe this Timberland shoe is unique, the designer did a great job here. The moccasin stitching at the front is a unique detail and it’s complemented nicely with a subtle logo on the back of the shoe. The laces are made from recycled material! Features also a unique Vulcanized design construction which will make sure that you’re feeling 100% comfortable. This shoe is available in Red, Black, Navy, Sleet washed, and Bungee Cord Washed.